On board the MSC Sinfonia you will have an unforgettable experience. Its impressive array of new features and facilities will satisfy any guest. The MSC Sinfonia has 765 staff members to help you live your dream cruise holiday travelling around Eastern and Western Mediterranean and South Africa. The newly renovated spacious balcony cabins will ensure you don’t miss any of the mesmerizing panoramic views. During the day you can enjoy a game of tennis, basketball or volleyball, get your heart racing at the fitness centre, enjoy the shuffleboard, mini golf or swim in one of the onboard swimming pools. After working all that sweat up, relax and unwind at the ‘Aurea Spa’ and be pampered at the beauty parlour. Worked up an appetite? No problem. On board the MSC Sinfonia you can experience the taste of an authentic Italian pizza at the ‘Caffé del Mare’ or enjoy the buffet at ‘Le Terraza’. After a satisfying meal, raise a pint at the traditional Irish Bar ‘Shelagh’s House’ or an exotic cocktail and dancing at the ‘Manhattan Bar’. For more cultured entertainment, visit the ‘Teatro San Carlo’, for more thrilling – the ‘Sanremo Casino’. Kids will never be bored with the choice of video games at the ‘Galaxy Video Games’. 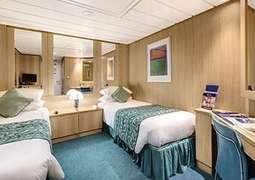 The MSC Sinfonia provides inner and outer cabins, as well as suites with balconies. 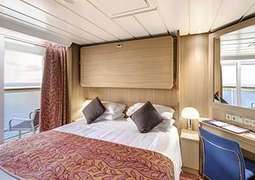 There are five stateroom categories for guests to choose from, in order to ensure maximum choice and suitability. 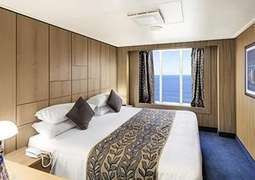 Comfortable beds, spacious cabins and a host of technical amenities come as standard across all stateroom categories. On the MSC Sinfonia you may choose between the two main restaurants, Il Galeone and Il Covo, and the spectacular outdoor restaurant, La Terrazza. The onboard restaurants serve up delicious classic Italian and other international cuisines. The buffet restaurant, Caffè del Mare, and various bars and lounges also offer the perfect setting for an after dinner drink. Boredom is the only thing you will not find on board the MSC Sinfonia. Have some outdoor fun at Doremi Spray Park; play basketball at the outdoor court on the sports deck or simply enjoy some well-deserved relaxation at the whirlpool bath. 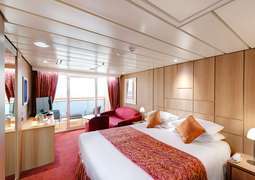 There are numerous lounges also on board in addition to a casino and theatre, hosting live shows. No matter what passengers are looking for there are multiple possibilities awaiting on board MSC Sinfonia. Sporty and comfortable clothing is recommended for leisure time and land excursions. Guests should be prepared both for gala dinners and informal events. Ladies should bring a cocktail dress or other formal equivalent and men should bring a suit or jacket.